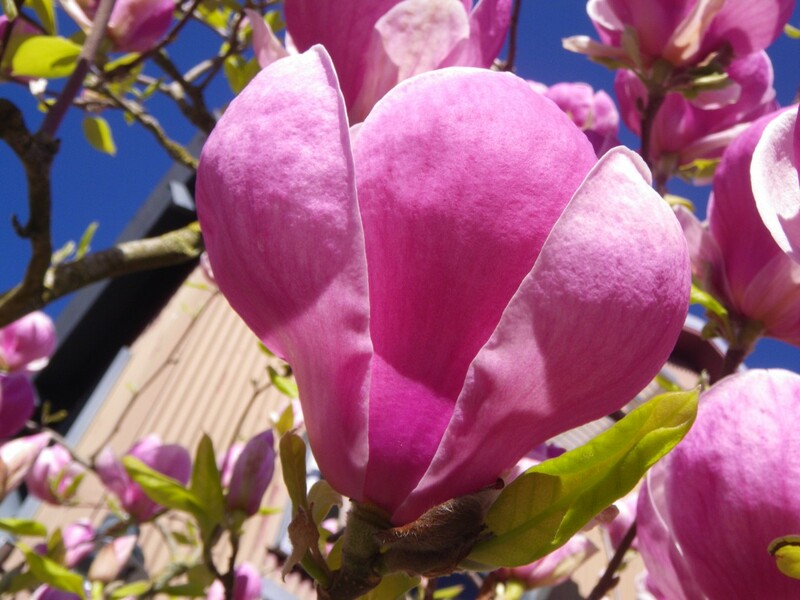 A garden favorite that is just coming into bloom is the magnolia (Magnolia spp.). They put out a spectacular flower displays in early spring; followed by showy seedpods that look like they come from another planet. Their wonderful pink or white flowers and evergreen shiny leaves are a garden focal point in spring. And their delicate fragrance! There are many varieties of the magnolia throughout Asia and the Americas. Although it is one of the oldest plants in existence, it wasn’t called the magnolia until the 18th century. 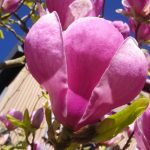 Long used for medicinal as well as ornamental purposes, the magnolia is now one of the most popular plants in the world. 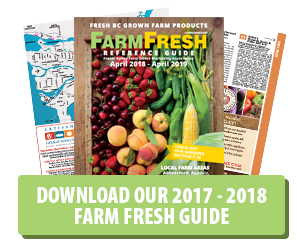 There are approximately 80 species and numerous cultivars that grow to become trees or large shrubs. The two main species we have in our gardens are the star magnolia (Magnolia stellate) and saucer magnolia (Magnolia x soulangiana). Here are some interesting facts to think about as your enjoy your magnolia. The magnolia is one of the oldest plant species, with fossil remains dating back 36 to 58 million years ago. In fact, magnolia developed long before bees did, so beetles pollinated the flowers. That’s why the flowers are relatively sturdy. Over time magnolias slowly changed their flowers to become more attractive to bees (to ensure successful pollination). Magnolias do not produce nectar. Instead, they have pollen enriched with proteins which bees use as food. Flowers release sugary scent which attracts pollinators. 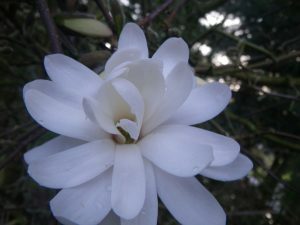 During the Ice Age, glaciers destroyed many ancient European forests, but not those in Asia or the Americas, resulting in plants that have wide distributions, like the magnolia, which is commonly found in China, Japan, North America, and South America. Magnolias have been cultivated in Asia since the 7th century and used for medicinal reasons since 1083. To the ancient Chinese, the flowers of the “Yu-lan” variety (Magnolia denudata), also called the Jade Orchid, were considered a symbol of purity, and they were grown in temple gardens since the 7th century. In South America, magnolias were known to the Aztecs as “Eloxochitl,” or the flower with the green husk. In 1570, the Spanish physician Francisco Hernandez took a scientific expedition to Mexico and created drawings of the Eloxochitl, which were re-edited and published in Europe in 1651.